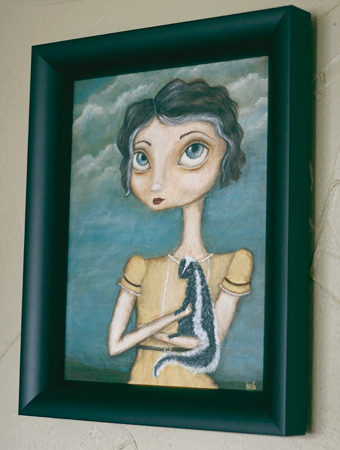 My new painting, Zoe and her Skunk, is now up for sale in my Etsy shop. I’ve been nabbing frames of various sizes when I see them on sale lately, so it was nice to be able to photograph it looking…finished. I don’t mind hanging canvas paintings without frames, as long as the edges are painted, but sometimes a frame helps a piece look a little more important, gives it a little more oomph. This is particularly true with the size of canvases I like to paint on. They can feel lost on a big blank wall without a frame to anchor them. In other totally random, train of thought blogging, an audiobook recommendation – Stephen King’s Under the Dome. I’ve been listening to it over the past few weeks while I paint and thoroughly enjoyed it. It’s definitely not an easy listen or read – there are some seriously disturbing scenes of violence against women – but it wouldn’t be considered “horror”. Think more Lord of the Flies for grown-ups. If you read (or listen to) the first chapter, you’ll be hooked until the very end, if for no other reason than to find out how the dome got there in the first place. Now what should I listen to next?